Large numerical displays are a great addition to any project where you want to be able to see information at a distance. 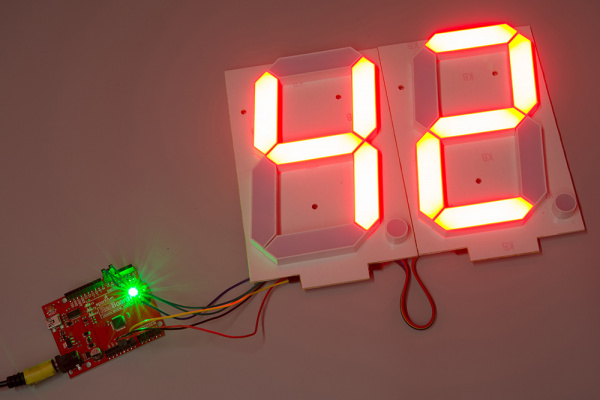 Scorekeepers and lap timers would be a great application for large 7-segment LED displays. The Really Big 7-Segment Display (6.5") fits that bill nicely. Driving several displays at the same time would be handy, which is where the Large Digit Driver board comes in. 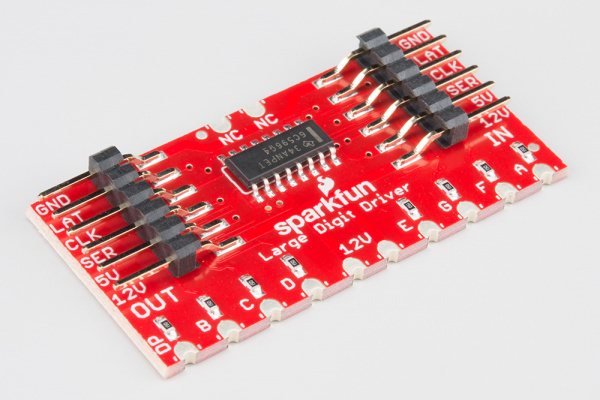 The Large Digit Driver can be soldered directly to the bottom of the 7-Segment Display. Several Large Digit Drivers can be chained together to create a display with multiple digits. Board Overview -- To begin, we'll go over each of the pins on the breakout board and their function. 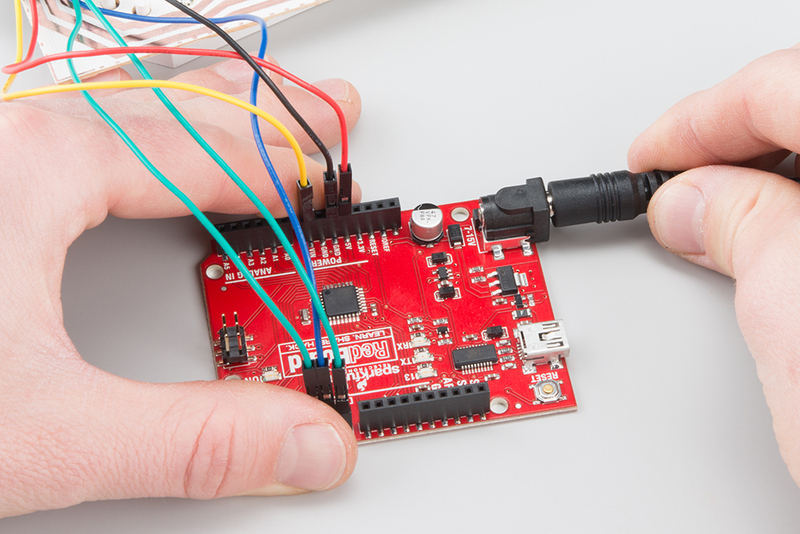 Hardware Hookup -- In this section, we'll show you how to hook the Large Digit Driver up to an Arduino. 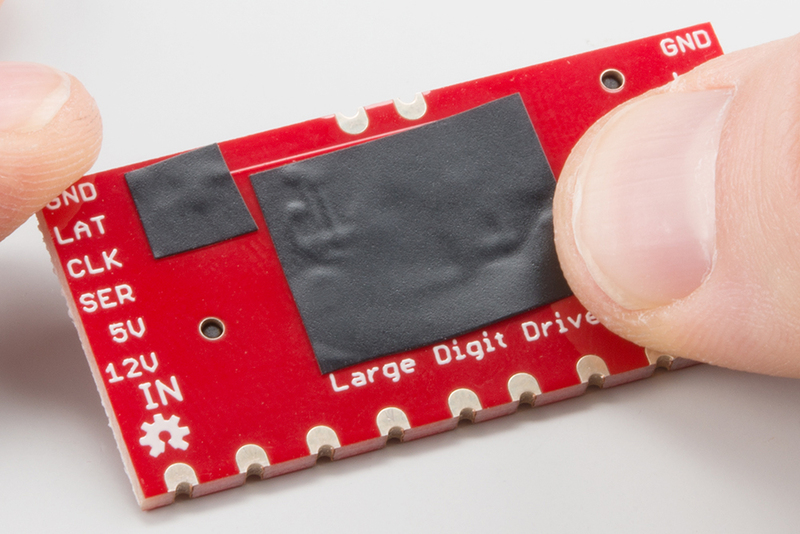 Example: One Large Digit -- Here, we give an example of an Arduino sketch to control one of the large 7-segment displays through the Large Digit Driver. Example: Two Large Digits -- We show how to daisy chain two large 7-segment displays together and control them with two Large Digit Drivers. Resources and Going Further -- This section gives some additional resources for getting more out of the Large Digit Driver. The Large Digit Driver has 6 input pins and 6 output pins. 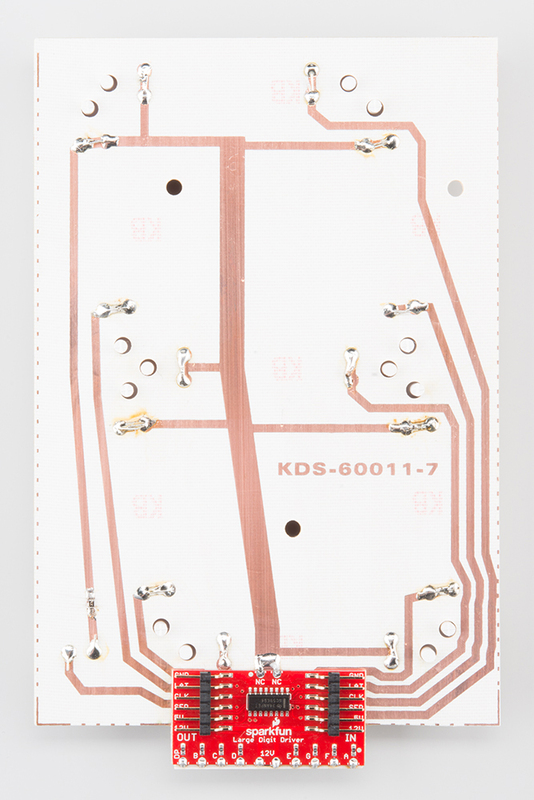 Before you attach the Large Digit Driver to the 7-segment display, you will need to isolate the exposed vias on the back of the board. Some of the Driver boards are created with through-hole vias that are not covered with solder mask. As a result, this could likely short out the traces on the back of the 7-segment display. We recommend using a piece of electrical tape or high temperature tape to cover the vias on the back of the Driver board. You will need to solder the Large Digit Driver to the back of the 7-segment display. 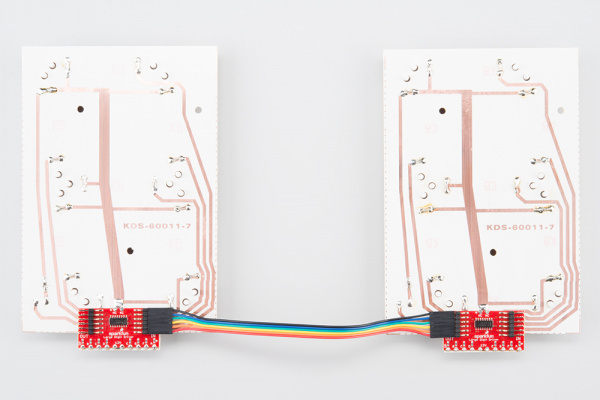 Have the Driver's 10 pins facing toward the bottom of the large 7-segment display and lined up with the traces on the back of the 7-segment display. Follow the Soldering Castellated Vias Guide to solder all 10 of the castellations as well as the 2 castellations at the top of the board (these should be attached to the 12V line and are just for mechanical support). We will be using the Arduino's regulated 5V and unregulated 12V (from the wall adapter) to power the 7-segment display and Large Digit Driver. Connect the Large Digit Driver to the the following pins on the Arduino. Plug your Arduino into your computer via USB cable. Open up the Arduino program and copy in the following sketch. Each display will use about 150mA with all segments and decimal point on. 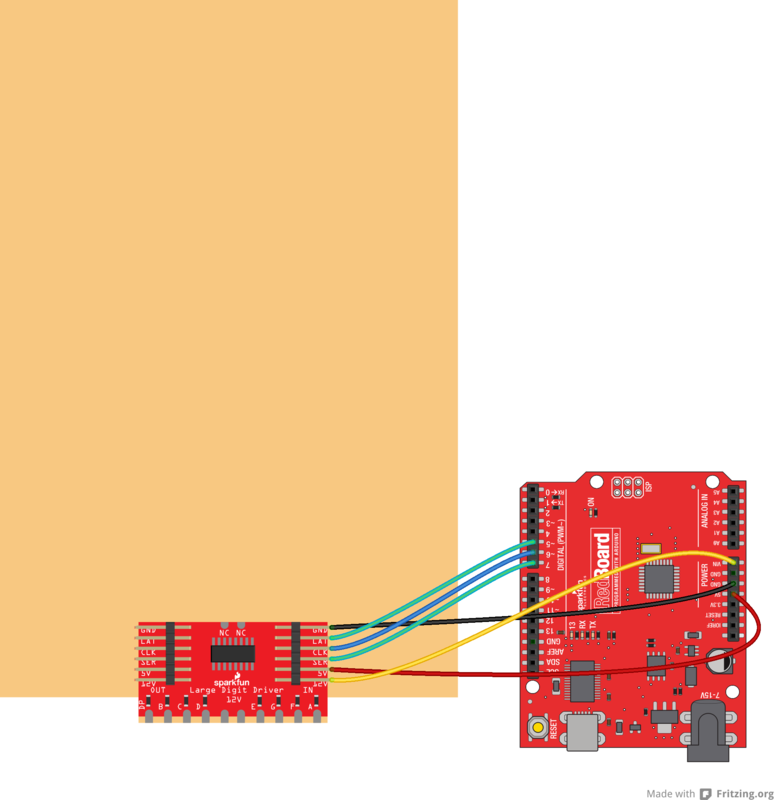 Upload the sketch to your Arduino, and plug the 12V adapter into the Arduino. Flip the 7-segment display over. You should see it count the digits 0-9 (the decimal point will appear on 9). 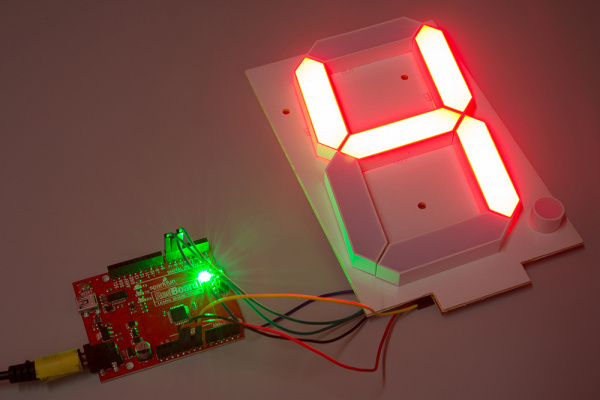 Use the 6-pin jumper wire to attach a second 7-segment display to the first display unit. Make sure that you connect GND of the OUT on the first display to the GND of the IN on the second display, LAT of the OUT on the first display to the LAT of the IN on the second display, and so on. 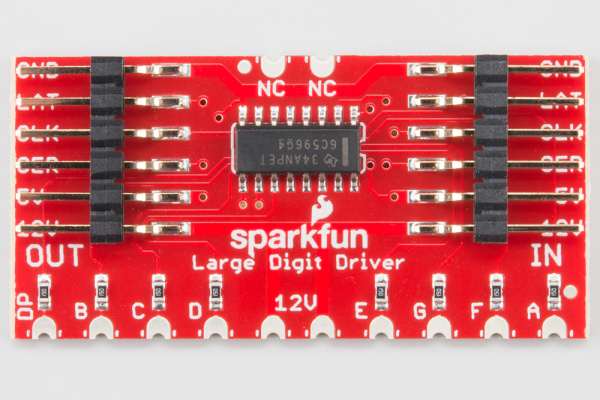 You will want to connect the Large Digit Driver on the right to the Arduino as per the Hardware Hookup section. Make sure the Arduino is plugged into your computer using a USB cable. Copy the following sketch into the Arduino program. This code demonstrates how to post two numbers to a 2-digit display usings two large digit driver boards. Upload the sketch to your Arduino, and plug in the 12V supply. The 7-segment display (now two digits!) should count from 00 to 99. To demonstrate the displays we built a device that measures the distance from the wall to a human. As that distance changes we can caculate speed. 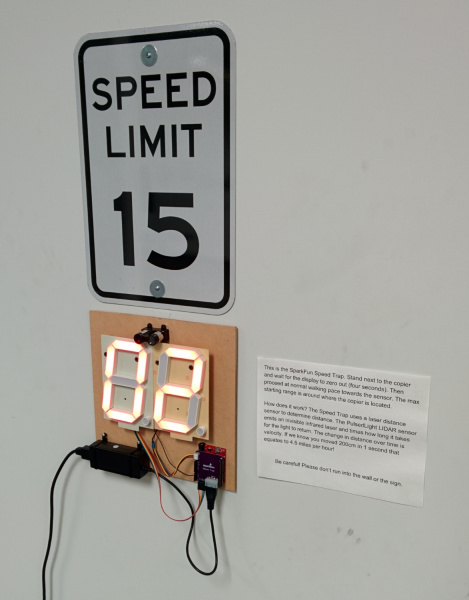 We present: The SparkFun Speed Trap! You can find the code and the PCB layout for the Speed Trap here. 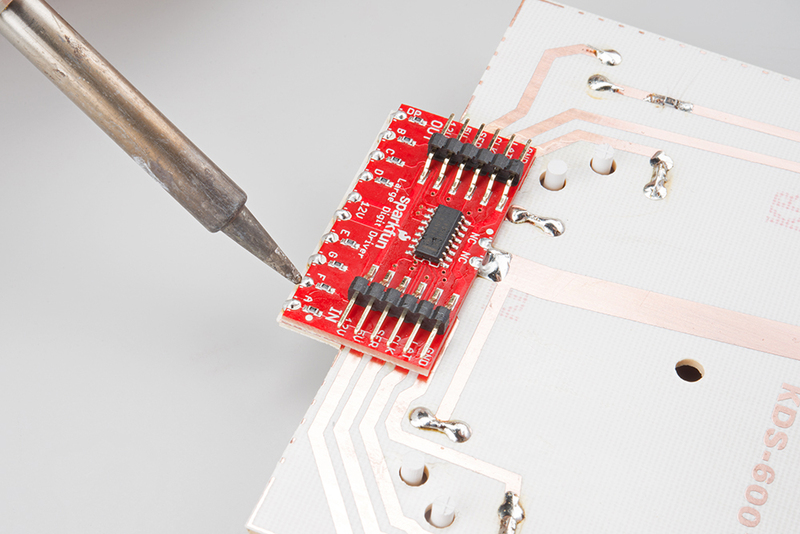 You don't need the custom PCB, it's fairly easy to build just with jumpers and a bit of soldering. readings we can calculate speed (velocity is the derivative of position). #define    LIDARLite_ADDRESS   0x62          // Default I2C Address of LIDAR-Lite. #define    RegisterMeasure     0x00          // Register to write to initiate ranging. #define    MeasureValue        0x04          // Value to initiate ranging. #define    RegisterHighLowB    0x8F          // Register to get both High and Low bytes in 1 call. //Too quickly and it gets twitchy. Too slow and it doesn't seem like it's responding. ceil(instantMPH); //Round up to the next number. This is helpful if we're not displaying decimals. Now that we have tested the large 7-segment displays, they are ready to be used in your project! Feel free to change the code to display other numbers or symbols on the displays.